From ancient times scholars have pondered over these two interrelated questions – why do men fight and what is the basis for the special relationship that develops between combat soldiers in wartime? There are numerous studies that address these perplexing questions but they tend to be case studies of a particular conflict, such as World War II and the Iraq War, and they do not adequately address our unique situation and experiences during the Vietnam War. In order to find a plausible answer to the question on why men fought in the Vietnam War, we need to start by examining the factors that brought these young men to the battlefields of Vietnam. Why was the Vietnam War different from other wars? Since the end of the draft in 1973, the US Army has had to attract its members and the motivating factors for sustaining a volunteer force are very different from that required for a conscripted force. So one important difference with the Vietnam War is that seventy-five percent of the troopers assigned to Bravo Company were draftees and most of the junior non-commissioned officers were also draftees. These draftees were not conscripted for the “duration of hostilities”, as was the case during the Second World War; instead they had a service obligation in Vietnam that was limited to a maximum of one year. Throughout the course of the twentieth century, several generations of Americans answered the call to fight in foreign lands. With reference to the troopers of Bravo Company, it is likely that they had some close relative, perhaps a father or uncle, who had fought in World War II either in Europe or in the Pacific. It is also possible that some had other relatives, perhaps a grandfather, who fought in Europe during World War I. The key point here is that there was a well-established tradition in most families to serve in the military when called upon, and this tradition was supported by local, state and national institutions, together with numerous nationwide organizations, like the American Legion and Veterans of Foreign Wars of the United States. In every war involving the commitment of American forces, we always had many who volunteered to serve in the armed forces. Like the draftees, these volunteers were influenced by family members who had served in previous wars and by the social norms of society. If their relatives had served in peacetime, it is highly likely that they referred to their time in the military as “the best years of their life”. There were many other factors that influenced their decision to volunteer for military service and probably included some of these motivating factors – patriotism, civic duty, adventure, travel, employment, education, the wide range of benefits available to military personnel and their families, and many decided to jump the gun and volunteered instead of waiting for an official draft notice. While these were the principal motivating factors that brought these young men to the Vietnam battlefields, it is important to point out that this involved a contract with Uncle Sam to serve 365 days in Vietnam and not a single day longer. This one-year policy also meant that we had a continuous flow of troopers and leaders who were either arriving or departing from Bravo Company. The significance of this time limitation was always evident in Bravo Company by not only the wide range of “short-timer” calendars in use, but also the bantering reminders by these short-timers that they would soon be heading home. While these bantering remarks were mostly expressions of happiness, they also contained a hidden element of sadness because of the approaching end to some very special relationships. On the question of why men fight, we have one set of motivating factors that brought these young men to Vietnam and then an additional set of motivating factors came into play once they joined their company. On joining Bravo Company, a trooper became a member of a team and this involved a very special and treasured relationship that develops between combat soldiers in wartime, often referred to as “the bonds between soldiers”, “comrades-in-arms” and “the band of brothers”. The use of “brother” highlights the importance attached to this special relationship, one equal to that existing between close blood relatives. The basis for these special relationships included the eligibility requirements for the Combat Infantry Badge and some other important factors. In essence, it was a relationship between troopers who were actively engaged in ground combat with the enemy, and in a situation where they were constantly and collectively exposed to danger over a long period of time. It is also important to remember that the Vietnam War was a very different type of conflict with the focus on guerrilla warfare and small unit operations. This meant that Bravo Company operated as a self-sufficient fighting unit and there was no strong feeling of dependency or the existence of special ties with the other units of our battalion. In fact, our contact with the other companies of our battalion was sporadic and normally limited to brief encounters when we relieved each other of a mission to secure a firebase. This was very different from the situation during the Second World War, where the infantry companies of a battalion had close and continuous contact with each other during both offensive and defensive operations. 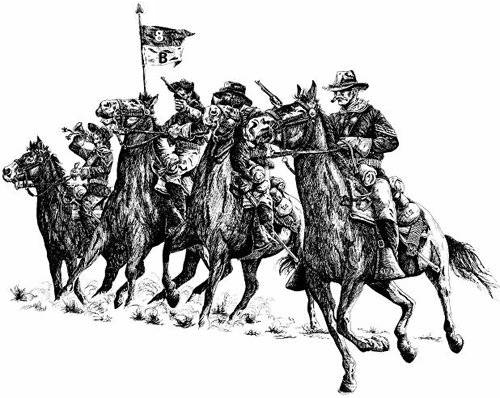 There were many facets to these special relationships during the Vietnam War and while unit cohesiveness encompassed the 1st Cavalry Division and the 2nd Battalion 8th Cavalry Regiment, the core unit was Bravo Company. And within Bravo Company, these special relationships were formed primarily at the squad and platoon level. As outlined above, there were several factors that motivated young men to serve in Vietnam for the specified period of one year. And what was the principal factor that motivated the troopers of Bravo Company to fight? There is a broad consensus among combat troopers that the bottom-line goes something like this: We were members of a band of brothers who fought to protect each other from harm. Samuel A.Stouffer, The American Soldier: Combat and Its Aftermath, 1949. Dr. Leonard Wong et. al., Why Men Fight: Combat Motivation in the Iraq War. U.S. Army War College Research Paper, July 2003. Christopher Buckley, Viet Guilt, Esquire Magazine, September 1983.